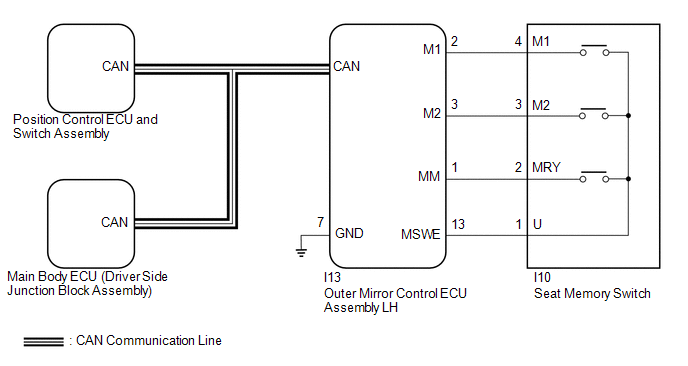 When either the M1 or M2 switch is pressed, the outer mirror control ECU assembly LH sends a switch signal to the main body ECU (driver side junction block assembly) via CAN communication. Then, the main body ECU (driver side junction block assembly) sends a recall request signal to the position control ECU and switch assembly. The position control ECU and switch assembly operates each motor to achieve each memorized position value. (a) Check that each function of the power seat operates normally by using the switches on the position control ECU and switch assembly (See page ). Each function of the power seat operates normally using the switches on the position control ECU and switch assembly. (a) Store a seat position in memory and check that the buzzer sounds to indicate that a position has been stored (See page ). The seat position will not be recorded if the SET switch and 2 of the memory switches are pressed simultaneously. Seat position memory function is normal. (a) Under each of the following conditions, check that the seat position restoring function operates by pressing the M1 switch or M2 switch (See page ). Seat position restoring function does not operate at all. Seat position restoring function does not operate when the condition is *1. Seat position restoring function does not operate when the condition is *2. Seat position restoring function does not operate when the condition is *3. (a) Store a seat position in memory for each of the M1 and M2 switches (See page ). (e) Enter the following menus: Body Electrical / Driver Seat / Data List. (f) Read the Data List according to the display on the Techstream. Mem appears on the Techstream screen. (a) Replace the outer mirror control ECU assembly LH (See page ). (b) Restore a memorized seat position (See page ). (c) Check that the buzzer sounds for 0.1 seconds and the seat automatically moves to the memorized position. On the Techstream screen, the item changes between ON and OFF according to the above.